I've been working with the limited release version and it's an amazing program. But, don't take my word for it. Request a demo and take it for a spin yourself. 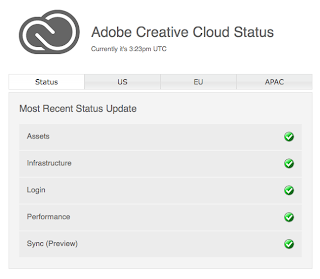 Adobe recently announced that for a limited time, you can join a special Creative Cloud plan. It includes access to Photoshop CC and Lightroom 5, plus feature updates and upgrades as they are available, 20GB of cloud storage for file sharing and collaboration, and a Behance ProSite. And it's just US $9.99/month when you sign up for a one-year plan, but you need to join by December 2, 2013. The South China Morning Post recently reported that as more and more Chinese officials are being blackmailed using faked digital photographs, the government is asking scientists for help. "Research teams at major universities have received funding from the central government to come up with ways to help the authorities quickly determine whether an image has been manipulated by photo-editing software such as Photoshop." It's a worldwide problem - forgeries of photographs. With this news, I'll bet the folks at Amped Software are working on a Chinese language version of Authenticate. 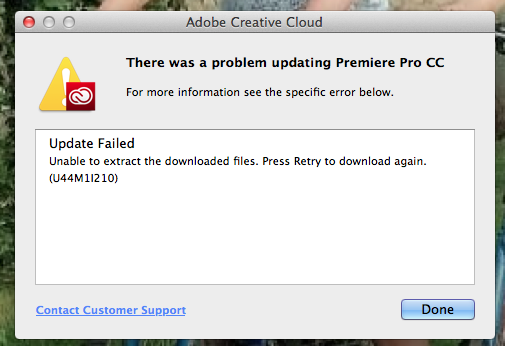 From time to time, as with any service, the Adobe Creative Cloud experiences problems. The easiest way to see if your service issues are on Adobe's side is to check their Status Monitor. Here's the link. I received the usual PoliceOne.com spam announcing a new company in the forensic imaging marketplace, FRP Forensic Imaging’s new NightThief forensic imaging technology. The OCD in me was alerted by the specific use of several words in the piece - like technology vs. software or product and "restoration" vs clarification or enhancement. The OCD went into overdrive with this bit, "NightThief imaging is available as a controlled service built around uncompromising ethics and usage frameworks. FRP Imaging’s commitment to responsible forensic imaging includes strict submission requirements, chain of custody prerequisites, and a no-nonsense licensing model designed to facilitate smarter criminal investigations while protecting the privacy and liberties of innocent individuals." What's a "controlled service?" Submission requirements? But then, the issue was laid to rest, "Because NightThief imaging is a service, there are no upfront costs, investments in time, equipment, training, or commitments required. More importantly, NightThief is built for speed with processing times rarely exceeding three days – and critical cases much faster! Dynamic all-inclusive per-event pricing based on senior agency involvement and community population provides simple, predictable, and affordable world-class forensic imaging to organizations and communities of all sizes." It's a service with per-event pricing. Ok. First question, who's going to come to Los Angeles to testify about the work done on the images? So, I went to the web site - FRP Imaging. It seems that FRP stands for Forensic Reverse Pixelation. I couldn't find out what they mean by the term, but it seems that they're a tech start-up coming out of the movie special effects industry. Judging from their FAQ page, they may run into significant resistance over a few of their policies. "Does any other company perform FRP Imaging or use NightThief™ technology? No. FRP Forensic Imaging™ and NightThief™ technologies are exclusive services of FRP Imaging." How will they handle the reliability/repeatability questions if they don't share their technology? What happens if they're compelled to release their tech to opposing counsel? What happens when their technicians are cross-examined about how their technology works? "Who owns FRP-processed images? We do. To control the application or FRP images, we license copyrighted FRP-processed images to acquiring agencies. Agencies may use them freely within departments, and publicize them in association with their case specific law enforcement efforts in perpetuity." I'm not sure how the "we license the results back to you - but we now own the file" policy is going to fly with LE agencies and the courts. "Are FRP images admissible in courts? Generally, yes. However, it’s important to remember FRP Imaging products are designed as investigatory tools." An investigatory tool that's generally admissible in court - at an "affordable price." Back to the who's going to come to your court and testify about the work and be cross examined, as is the defendant's right? No one, it seems. "Each FRP processed image includes a notarized sworn statement made under penalty of perjury certifying the image was not modified, original enhanced, created, edited, or manipulated in any way that adds or removes any element from the image, or portrays any suspect in an unfavorable light beyond the actual image provided. If enhancement(s) were made, it is noted along with its purpose (scale, proximity, detail, etc.) ." How do you cross examine a "notarized sworn statement?" I'm interested to hear back from them to find out more about how they see this working. Processing images from cell/mobile phones and tablets has been an increasingly larger part of my workday this year. Folks are capturing so much of their lives on their mobile devices. They post these pictures and videos to Facebook and other social media sites. They also send the pictures to their friends via text or MMS messages. But what happens when a mobile device is received as evidence? What's the best way to get those pictures and videos (the evidence) out of the device and into your analysis software for processing? Let's start with how not to do it (though many are using this method). Don't browse through the device to find the images/video - then send them as MMS messages to your own phone or e-mail address. The problems of mixing your e-mail or phone with the case files notwithstanding, sending the files via MMS adds compression, strips some vital metadata, and changes hash values. So, in my test, the physical dimensions have been reduced and the file recompressed at a lower setting for transport. What do you think will be the outcome if you're trying to discern fine details within the image? Instead, use a purpose built solution for extracting data from mobile devices. Use Cellebrite, FinalMobile, MSAB's XRY, or any of the other tools that work best for your device. These will download the files without changing or recompressing them. These tools preserve the evidence and provide a report of the process utilized. These tools have been to courts across the world and are used daily by forensic teams in private and public service. Sending yourself a text from the suspect's phone? I'm guessing that you may have a problem with that one in court. Right before getting wracked with a massive head cold, I was trying to solve the NMV file puzzle. Well, I'm happy to say … it's solved. I managed to track down the company that purchased the very old CCTV business. 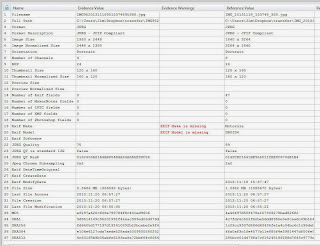 The card/software, RConTech DVR, was developed for Win95 / Win98. It was discontinued around 2004 and finally went out of support in 2009. The DVR saves the files in a proprietary format. When attempting to back-up, you're given the usual two choices - out to AVI or out to a "native file" type. In this case, the NMV file is a transcoded copy of the original. The software allows you to choose the compression type for its AVI export, but not the NMV. So, running in compatibility mode as an administrator, the program is fairly stable. 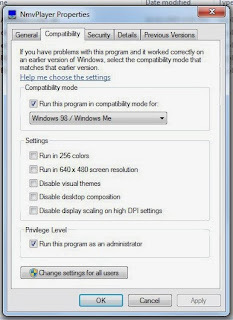 To get there, right click on the program's icon and then click on the Compatibility tab. 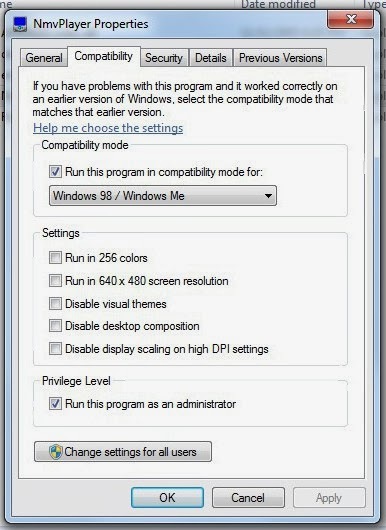 Select the version of Windows that you need - in this case Win98 was stable enough. The 18th Worldwide Exhibition of Internal State Security, also known as Milipol, is about to start in Paris. The list of exhibitors for forensic science services and law enforcement is pretty impressive. 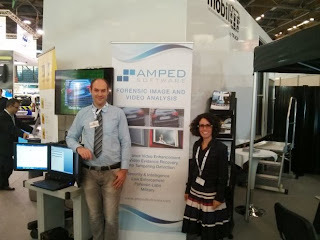 Our friends at Amped Software are in Paris for the show. You can find them in Hall 5 (5 S 160). Like many of us, my "forensic workstations" are air-gapped. That is, they're not connected to the internet. Any software updates are first downloaded on a clean workstation, tested, then applied via SneakerNet. I've got an Epson all-in-one that has suited my needs quite well. Then, something happened and I needed to update the driver. 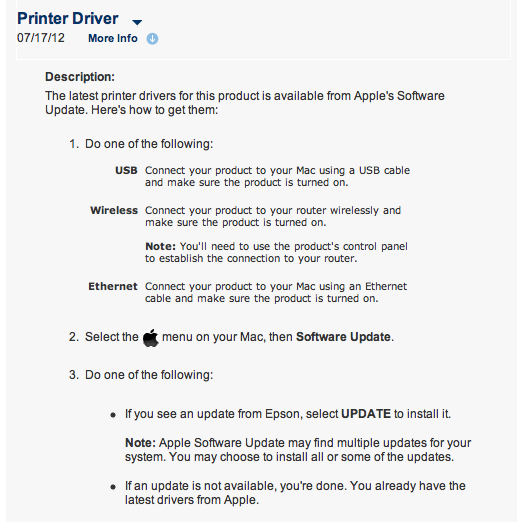 Fine, except that Epson now does all of its driver downloads through Apple's Software Update. Apple's Software Update only works when you're connected to the internet. 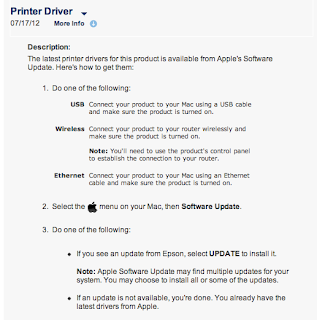 I called Epson to see if there was a way around this (Apple's OS installers can be found on your hard drive and loaded onto a USB stick for transport). They said no. There are no work arounds and there are no links anywhere to download the updates. You must use Software Update. The Artisan 710 that's sitting on my table is now just a copy machine. It no longer prints from the computer that sits next to it. Needless to say, it's my last Epson product. So, I'm prompted to download the update to several CC apps. 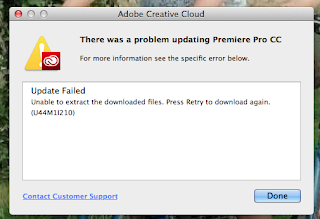 I get through most of them, but Premiere Pro CC and InDesign CC fail to update with the above error message. I go to the Adobe Forums and find a "resolution." But, it doesn't work. I find a user whose experience mirrors mine and use his "solution." It doesn't work either. It seems that the error involves not being able to unpack the downloaded files. Hopefully, I'll find a solution soon.